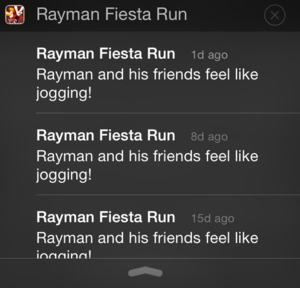 When Notification Center arrived in iOS 5, we greeted it with a sigh of relief. No more alerts lost to the ravages of time, easy access to all of our notifications in a single place, and even a handy way to get a look at the weather or stock info. 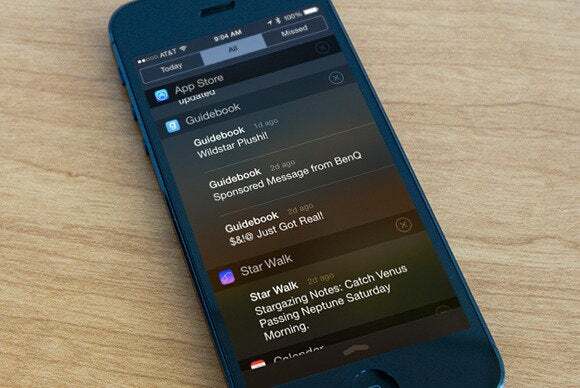 But as the years have passed, our enthusiasm for Notification Center has dimmed as we’ve realized that most of its original limitations are still around. Even some of iOS 7’s updates to Notification Center served only to increase our frustration, adding less-than-useful features while avoiding fixing its most glaring annoyances. As we sit only a few months away from the likely announcement of iOS 8, we’ve compiled a list (with the help of a few of our Twitter followers) of our biggest frustrations with iOS’s handling of notifications—along with what we’d like to see Apple do about them. Somebody call Hercules, because clearing out Notification Center can be a task of epic proportions. 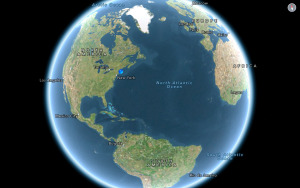 You’ve surely had a moment when you’ve wanted to just raze everything in Notification Center from the face of the earth—if you’re anything like us, perhaps as often as once a day. But if you’ve ever actually tried to clear out Notification Center, you’ve quickly discovered that there’s no easy way to do so. Rather, you must tap the “x” icon next to the application name, and then tap the Clear button that takes its place—and then repeat the process for each app. And you may have to go through a dozen (or more) applications. Surely it would be faster to have a button, say all the way at the bottom of Notification Center, that simply declares notification bankruptcy? We’d certainly appreciate it. Tapping the small 'x' and the Clear button is still a frustration that often results in hitting the wrong thing entirely. Since so many of our frustrations appear to be connected with clearing items out of Notification Center, let’s take things a step further: What if Notification Center could automatically let certain items “roll off” as they no longer became relevant? After three weeks, that to-do item that you ignored probably isn’t a high priority; nor is that week-old text message or email. While not every item would be a candidate for auto-clearing, there are plenty of places where it would help avoid the build-up of outdated cruft. Allowing certain types of notifications to have expiration dates would greatly simplify managing Notification Center, not to mention making it more relevant by focusing on only the most pertinent items. Moreover, iOS could be a bit smarter about connecting the dots to determine when notifications can be cleared. For example, if I read a text message or email, chances are I no longer need to see its notification. The same goes for Twitter mentions, Facebook status updates, and the like. In general, if I’ve opened an app, I no longer need to see its notifications. Having to mark things as read within an app and then again in Notification Center is both redundant and ridiculous. The same goes for notifications that pop up on multiple devices. Apple’s already working on cross-device notification syncing with iMessages, FaceTime calls, and even email. But it would be nice if there were a simple way for every app’s notifications to be cleared, on all our devices, once we’ve dismissed them on one. 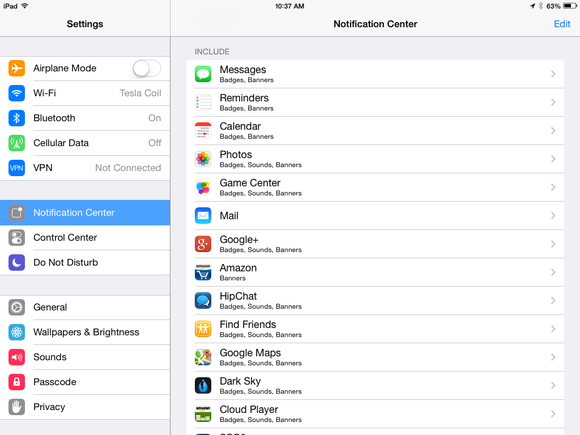 We’ll just come right out and say it: Settings > Notification Center is a bit of a mess. While we appreciate the capability to manually arrange the order in which applications appear in the notifications list, “no order” is not an acceptable organizational scheme for the settings screen itself, especially now that many users have a plethora of apps. What order are these apps in? How do you find the one you're looking for? A search or filter field would go a long way to making it easier to find an entry. Currently, finding a particular app and tweaking its notifications requires slowly scrolling through the app list—and if you miss the app, well, it’s back to the top to start the process again. If alphabetical order doesn’t work (because of the manual sorting option), then at least throw us a search or filter field so we can find the item we’re looking for. The situation’s little better within each app’s entry. Turning off all notifications for a particular app requires multiple taps to deactivate banners/alerts, turn off app badges, deactivate sounds, and remove from Notification Center and the lock screen. A single option to deactivate all notifications for an app would be much appreciated. 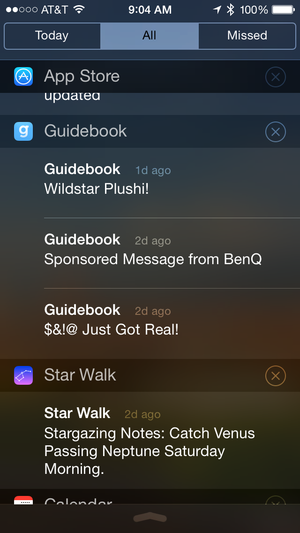 Turning off all notifications for an app requires at least five taps—why not just a single toggle for all of them? And while we’re considering turning off notifications for an app, perhaps iOS could give us a helping hand by letting us know exactly which apps are sending notifications. An indicator in the Notification Center app list showing which apps have recently sent us notifications, like the one in Location Services that lets us know which apps have requested our location in the past day, would be very handy indeed. The iPhone and iPad make for great gaming devices—until you’re in the middle of an intense bit of action and a notification pops up on the screen. Even if it’s just a banner (which appears at the top of the screen and then fades out), rather than a modal alert, it’s still distracting. And even on the latest Apple devices, with all their horsepower, Notification Center banners still seem to bog down the device for a second or two. Similarly, we suspect that many reading this article have been in a situation where they were using their phone for navigation in the car and were interrupted by a modal notification right smack in the middle of the screen. This one’s not only annoying; it’s also dangerous, as you have to take your eyes off the road to dismiss the alert if you want to be able to glance at the screen for navigation help. And it's just as annoying—if not as dangerous—when notifications interrupt your movie-watching sessions. iOS offers a convenient Do Not Disturb mode that silences incoming calls and alerts. And if you’ve enabled (in the Do Not Disturb screen of the Settings app) the new Silence: Always option of iOS 7, you can temporarily prevent notification interruptions by manually enabling Do Not Disturb mode using Control Center. But this silences notifications and calls, and it requires that you remember to manually enable Do Not Disturb before every activity (and to manually disable it after each activity is finished). Though we suspect this approach would be too “fiddly” for Apple, we’d like to see an API that developers could use to let you disable, within an app, notifications while using that app. We’d even be happy with just a device-wide setting that would let you disable notifications when using particular categories of apps, such as Games, Entertainment, or Navigation. If an app offers notifications, you’re asked, the very first time you launch the app, if you want to allow it to use notifications. 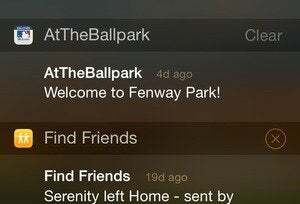 The problem is that you may not know if you want notifications from that app until you’ve used it for a while. We’re not sure what the perfect solution would be here, but there’s got to be a better way. On that note, when you do agree to let an app send you notifications, you’re stuck with a particular set of notification settings—unless you really want, say, banners, app badges, and sounds, you have to manually change those settings for each app. We’d like to be able to choose default settings for allowed apps so, for example, apps don’t use audible notifications unless we explicitly tell them to do so. Developers: Don’t do this. Just. Don’t. Many of us end up with a constantly empty Missed tab in Notification Center, not to mention a false sense of not having missed anything important. 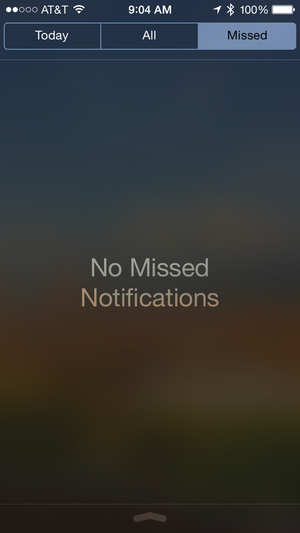 If the responses from our Twitter followers are any indication, iOS 7’s attempt to divide Notification Center into Missed and All lists didn’t quite hit its mark. The All pane, for the record, is supposed to contain all of your notifications, while the Missed pane contains only those you haven’t addressed in the last 24 hours. But neither seems to work quite as designed: For many people, the Missed pane is always empty, while for others—us included—it often displays notifications that we’ve not only seen but have actually acted upon. The easiest solution would seem to be merging these two views back into a single list. For example, Apple could take a cue from a tried-and-true interface: the Recents pane of the Phone app. Give us a list of notifications in reverse chronological order (either by app or intermingled, depending on your preferences) and highlight the ones that we might have missed. Simple, easy to read, and proven. 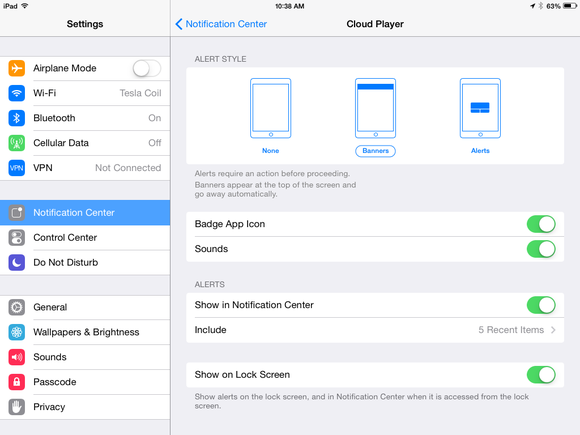 There are also a few minor tweaks we’d like to see that would make Notification Center more useful. For example, we’d like to be able to specify only particular calendars to be included in the Today view—we don’t really need to see our sports-team calendar subscriptions each time we open Notification Center. On the other hand, we often do want to see all-day events in the Today view, but these events aren’t displayed. How about a simple toggle in Notification Center settings for choosing whether or not they appear? It would also be nice if notifications were a bit longer. As one of our Twitter followers pointed out, Notification Center could be perfect for keeping an eye on Twitter replies without having to open your favorite client … except that many tweets get cut off, forcing you to launch that client just to view the three words you couldn’t see. 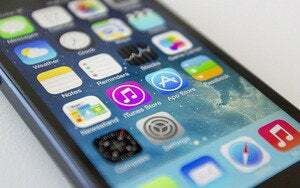 Admittedly, it’s unlikely that Apple will choose to address all of these issues in a forthcoming iOS update, but with all this room for improvement, we certainly hope a few of them might find their way to top of the priority list.